Hello, hello there! 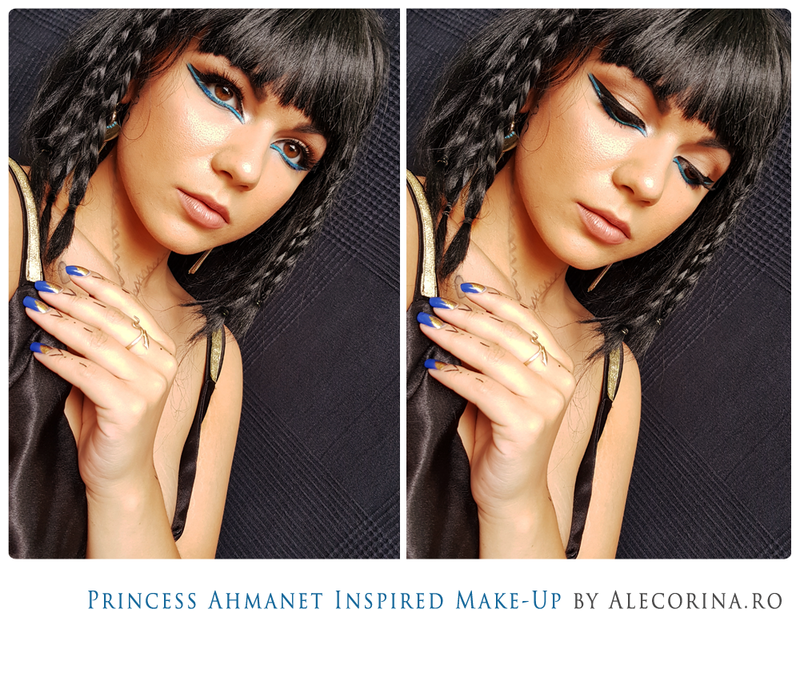 Since recently I have been watching The Mummy, starring Sofia Boutella as Princess Ahmanet, I got inspired to do a make-up to represent her days as the Princess. Her make-up was quite simple, but she wore many tattoos. For the following eye chart I used Too Faced – Sweet Peach Palette. To start, make sure you take care of the brows. She has straight long brows and very black. I used a Nyx Brow wax to flatten my brow hairs and than I used a black eyeshadow to shape them and darken them. To start with the eyes, after I primed I used “Peaches’N Cream” all over the lid the set the primer. Sience her eye lid is mostly simple, and the focus is on the lower lid, I used “Puree”, a soft brown to define the crease. Make sure to go a little bit over your natural crease and make it more wide, where your brows ends. To deepen it a bit more, I used “Charmed, I’m Sure”, a deeper brown, and I focused it only on the hallow of the crease. I wanted to add a bit of something all over the lid so I went very light handed with “Luscious”. The lower lash line is the statement of her make-up, and I started with a cream eyeshadow stick, Rimmel Scandal Eyes in Tempting Turqouise. Make sure you extend the natural line of your lower lash line both inner corner and outer corner, where your brow ends. To set the creamy stick, I used a blue eyeshadow from the Bh Cosmetics palette, “Foil Eyes- 28 Color Eyeshadow Palette”. 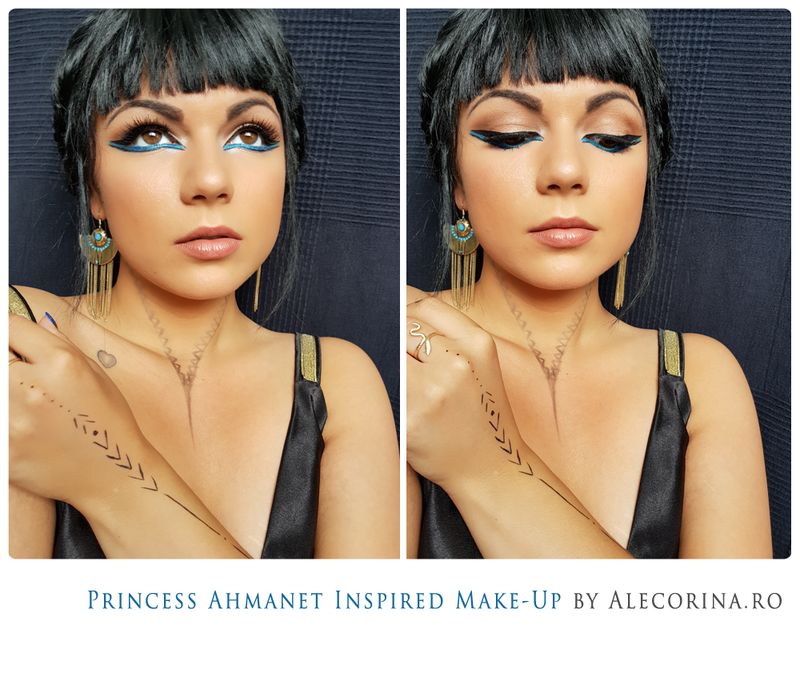 Right after, I used a black eyeshadow “Tempting” to outline the blue line. To define everything I used a liquid liner to draw a thick straight eyeliner on both lower and upper lash line, making sure to leave the empty space in the inner and other corner. 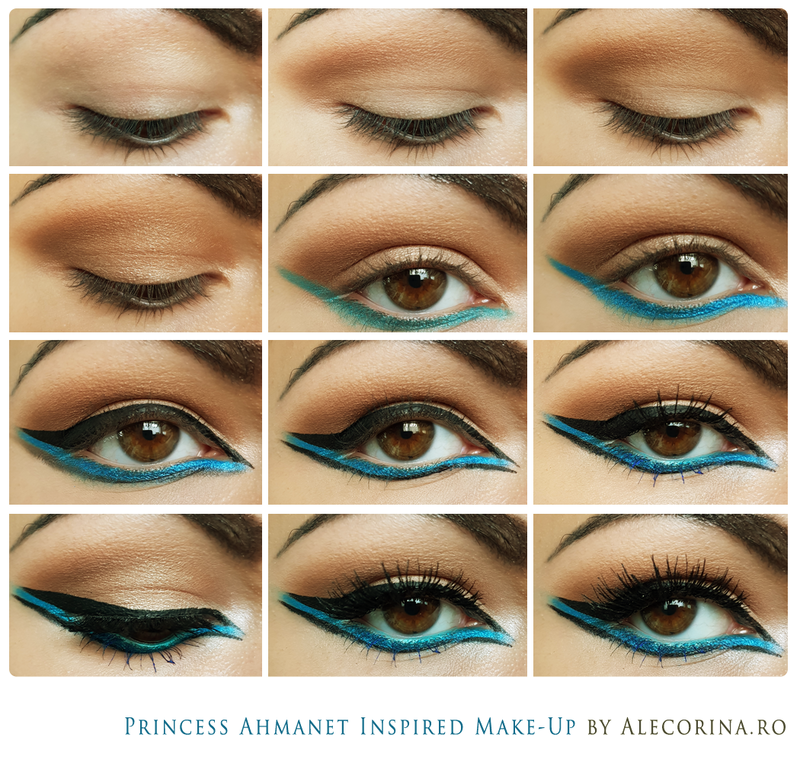 Last step is black mascara on the top lashes and blue mascara on the lower lashes. For a bit of drama I added a pair of falsies on the top lashes and a bit of “Nectar in the inner corner to brighten everything up. For the face I used Yves Rocher Zero Defaut Fond de Teint in Beige 300 and I set it with a loose powder by Bh Cosmetics – Bh Studio Pro Tinder Hd Powder in Medium. The important part is to add a lot of warm to your face and body using a contouring powder like Wet’n’Wild Contouring Palette Contour in Dulce de Leche. I also used as a blush/bronzer the Milani Baked Blush in Bellissimo Bronze. I used it all over the forhead, cheeks, jawline, neck and colar bones. Of course we have to highlight everything using Glowcomotion in W7- Shimmer Highlighter Eyeshadow. For the lips I used the NYX Full Throttle Waterproof Hydrofuge – in Kiss the Dust and in the center I added a bit of NYX Butter Gloss – in Tiramisu. 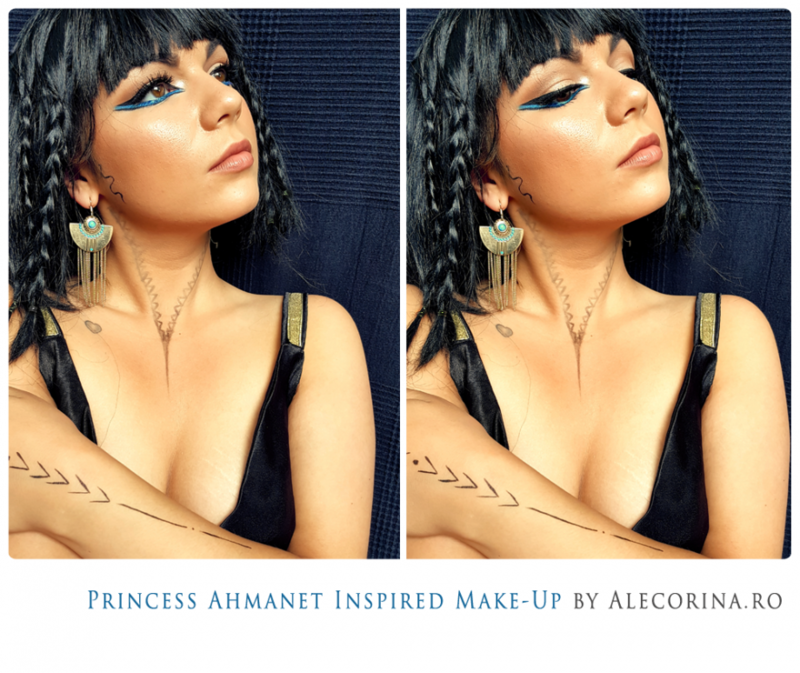 Lastly I draw her tattoos on the neck and sides of my face and I set everything in place with Make-up Revolution – Oil Control Fixing Spray, and added a black wig, since Pharaohs were definitely not blonde :)). The list of the entire products used is down below in the gallery. Thanks for stopping by on this blog post and see you in my next one!